USS Nicholas (DD 449) off Boston, 15 August 1942. “Outstanding among the destroyers of the Pacific Fleet . . . ” said ComDesPac in 1944 of USS Nicholas, DD (later DDE) 449, “ . . . a noble ship” whose 27½-year record spanned the history of Fletcher-class destroyers in the US Navy. Top: from motion picture film of Nicholas alongside Missouri to transfer Japanese pilots and emissaries, 27 August 1945, courtesy Lars Andersen. Bottom: “Triumph and Peace” by Tom Freeman, depicting the same event. Built at Maine’s Bath Iron Works, the second Nicholas was, in 1942, the first of the 175 2,100-ton Fletchers launched and commissioned and, in 1970, one of the last retired from the Navy. The “Nick” was named for the senior officer of American Marines. In World War II, she served as flagship of Destroyer Squadron 21 and earned 16 service stars on her Asiatic-Pacific campaign ribbon including two for submarines sunk. For action in the Solomon Islands in 1943 with Radford, she was awarded one of the first Presidential Unit Citations—a token, Admiral Nimitz told the crew, of “the respect and esteem which this ship, her officers and men have well earned throughout the Navy.” For action in the Philippines in 1944 and ’45, she also received the Philippine Republic Presidential Unit Citation. November 1966. Click to view either image in more detail. As the end of World War II approached in August 1945, Admiral Halsey ordered that Nicholas and the other two survivors of the original DesDiv 41, O’Bannon and Taylor, be present in Tokyo Bay for Japan’s surrender “because of their valorous fight up the long road from the South Pacific to the very end.” Assigned with these sisters to his Flagship Task Group, the Nick steamed ahead of the formation on 27 August to receive Japanese peace emissaries and harbor pilots for transfer around the fleet. 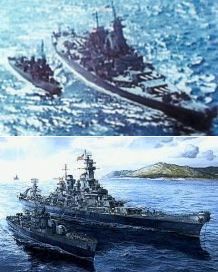 Two days later, the three destroyers led the battleships Missouri and Iowa into Tokyo Bay where, on 2 September, Nicholas transported Allied representatives to Missouri for the surrender ceremony. Mothballed and then modified in both 1950 (DDE) and 1960 (FRAM), Nicholas completed fourteen more Western Pacific deployments and saw action off both Korea (5 service stars and the Korean Presidential Unit Citation) and Vietnam (9 stars). 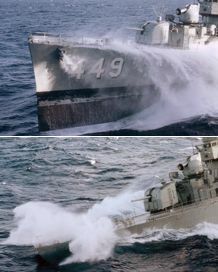 The Navy’s oldest active destroyer in the sixties, she also participated in the Apollo 7 and 8 spacecraft recovery missions before being retired in 1970 and scrapped.